Wbat You Doing With That Reindeer? It was a bit unusual getting on a weekday train to head north, though it didn’t seem any more or less busy than our normal experience. Soon Newcastle was surrounding us and we could make the traditional stop off at Centurions to recover. 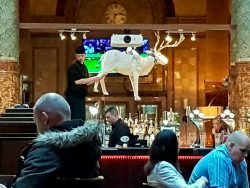 There we were amused watching the bar staff attempting hang a reindeer over the bar (there was the sudden crash that we might have been expecting though). Christmas decoration secured it was off to check into the hotel before heading back out into the city. We wandered a bit and found our way into The Goose for a snack. It was beginning to get dark by then which gave the perfect chance to visit Fenwick’s windows, a Christmas time tradition. 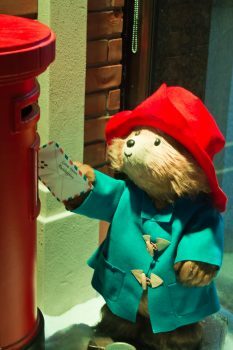 This year was Paddington Bear, with the lovable bear getting up to all sorts of mischief. Having seen the window displays we found our way into the store, where we couldn’t resist a commemorative deluxe edition of Paddington. We also couldn’t resist a trip up to the third floor and the toy department (another tradition), where Heather enjoyed building things with some magnetic connecting thingies. We were by now beginning to think about dinner. We decided to think about it some more in the Bridge Hotel, one of our favourite Newcastle pubs. From there it is only a short stroll around the corner to one of our favourite restaurants, The Herb Garden—who’s food was as good as always but disappointed on the cocktail front this time. Afterwards there was time for a quick drink in the Mile Castle (having rejected the now depressing Union Rooms) before bed. The morning was spent wandering around the shops, getting last minute presents for others and ourselves. Having seen a few shops, including the Calendar Club store up on the Eldon Square bridge, we did find time to call into The Hotspur (with a little lesson on Harry Hotspur for Heather) before we had a dinner date. 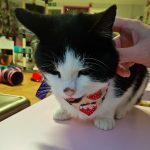 That date was at our favourite cat cafe, Mog on the Tyne. The cats were on good form—once they realised we had food anyway! We were under strict instructions not to allow them to have any of course but that’s easier said than done when they do their best to hide under the table waiting for any inadvertently dropped scraps (that’s when the tactic of simply sitting on the table looking hopeful doesn’t work). The food selection there seems to have improved a little too, so it was a good lunch surrounded by the puds. Afterwards we called in the rather hidden but cool Glamorous Owl before a pit stop once more in Centurions and the hotel before getting a bus across the bridge to Gateshead. We were heading into Gateshead for this year’s Enchanted Parks, something of another tradition in itself. Last time had been quite disappointing so we were a bit nervous of what we’d find as we strolled into the darkened park. We needn’t have worried though, as this year was a great return to form. 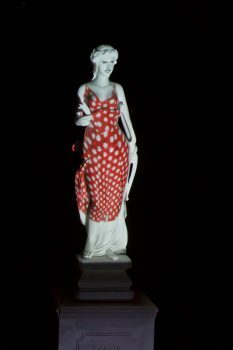 Having been greeted by a large sound and light installation, including shadowy dancers in the bandstand, we found ourselves confronted with a talking, shimmering statue. The statue was inhabited by The Wandering Mind of Ursula Wailes, the eccentric who’s Inventor’s Ball we were at, or so the theme this year went. A piece by Davy and Kristin McGuire the statue was entrancing as it’s dress (or lack of) shifted and shimmered as it spoke. A fine introduction to the trail. 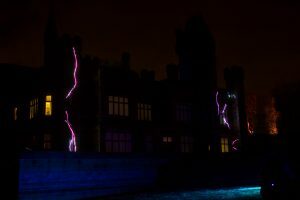 From there we went through the dark to Seb Lee-Delisle‘s laser projections on Saltwell Towers—a much more subtle use of the building than the introductory projections which had become somewhat standard and repetitive with each year’s event. The fizzing lightning effects were available to watch as one pleased rather than being huddled into a little group and given a lecture. The student piece of Seeds of Knowledge, a bunch of ceramic acorns, was slightly disappointing, perhaps due to its simplicity, but the next attraction soon made up for it. Intrude attracts by its sheer bonkers scale, a colony of giant white rabbits sitting on the hexagonal green by the Towers. Their silent, brooding presence—made starker by their white simplicity—dwarfed the visitors milling around them. We circled them, never too close, as if they might bound off in a moment to whatever strange land of giants from which they came. 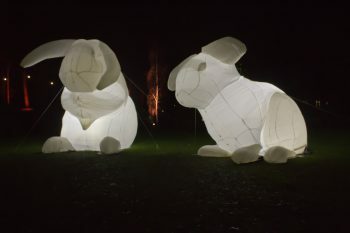 The rabbits continued their silent vigil behind us as we passed down through the sleeping animal enclosures to a field of swaying lights awaiting us at the bottom of the hill. Shipping Forecast by Pete Johnson is a field of around 500 fibreglass stalks, each topped by a little glowing light. 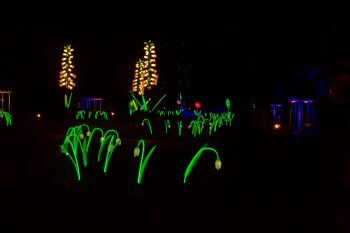 The light changes colour as the stalks sway in the wind or, much more fun, are bopped by those wandering through. We had fun wiggling them, though it was a bit difficult to get enough of an overview (and too sheltered) to really see patterns the wind may have made. Another trick was to make the rose garden grow some seriously peculiar looking plants and flowers. 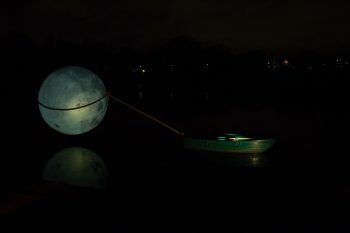 Reminiscent of the roses (which weren’t in the rose garden) from last year but closer in scale to the garden during Lumiere London (though these were actually less alien and more recognizably Earth-like grown light and large), we circled the enclosed space about twice taking it all in. Coming out the rose garden brought another view of the swaying Shipping Forecast and a glimpse of the looming bunnies before heading down into the dean, where Saltwell Towers offered a welcome stopping resting point. We didn’t fully investigate but the food offering doesn’t look to have improved much—surely a missed opportunity for a little street food market. There was however a welcome craft market upstairs, one store in particular providing christmas gifts for ourselves and others. Then it was on, into the dark and mysterious woods, where apparently pineapples grow, but only if you sing to them. 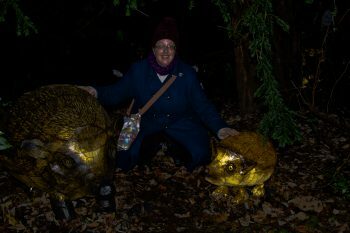 The woods were also full of mysterious glowing creatures including, to Heather’s delight, giant hedgehogs, as well as a fox and badger. Down by the stream, past some glowing musical toadstools, a menagerie of animals played in front of a waterfall, with a shadowy dancer behind. We stopped and watched them play awhile before heading away out the bottom of the dean, and nearly out the trial. Another student piece, Flowers for Ursula was a brief, but again too simplistic, distraction before the final set piece. Spirit of the Cyclone suffers from only running every 15 minutes (even if someone did knock a few minutes off the countdown clock), which with people waiting on the narrow path in the cold isn’t great (though at least it gave a chance to note Ursula had put the Moon back in the sky). It also suffered from the smoke effect looking a little amateurish, presumably supposed to hide more the rig of which an acrobat was wheeled in. 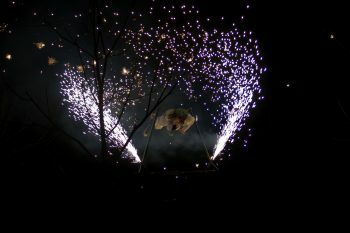 She took to swimming through the air, before spinning in what was a least a spectacular pyrotechnics show. And then it was off, back to where we’d started and the noisily lit bandstand. A little shame there wasn’t another piece or two to accompany our departure but overall a great improvement on last year, if not as good as when we followed Alice. There were quite a lot of photos from the night. We hopped a bus down to Gateshead for a late dinner in the Wetherspoons there before squeezing into a surprisingly busy Central for a nightcap. Our last day of the little trip, so we left the bags in the hotel and headed out for some art. 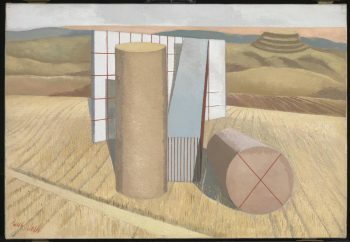 Having managed to miss it in London I took Heather along to see a Paul Nash exhibition at the Laing. I knew Nash mostly as a surrealist (I think I first became fully aware of him when staring at Equivalents for the Megaliths on a visit to Tate Liverpool during some down time at Daresbury MEIS laboratory* which I’ve just found out is now at Huddersfield), so it was interesting to see his earlier bleak impressions of war. It’s still the strange and reality disjointed surrealist works that attract though, such as Pillar and Moon or the disconcerting Landscape from a Dream. We came away hungry and looking for food, which led us to Hadrian’s Tipi, a little pop-up food village on the site of what was once the Odeon cinema. There I discovered the wonders of the yorkshire pudding wrap—highly recommended. It was time to collect the bags and head for the traditional final drink in Centurions, before the train home. A lovely little break, with many photos. 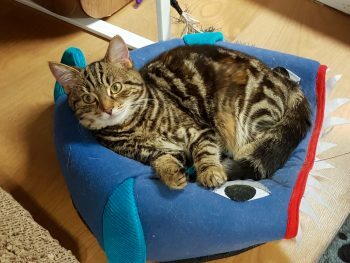 The post To The Magical North was first published on Friday 5th January 2018 at 8:00 pm but relates to events about 4 weeks earlier from 4–6 December 2017 .